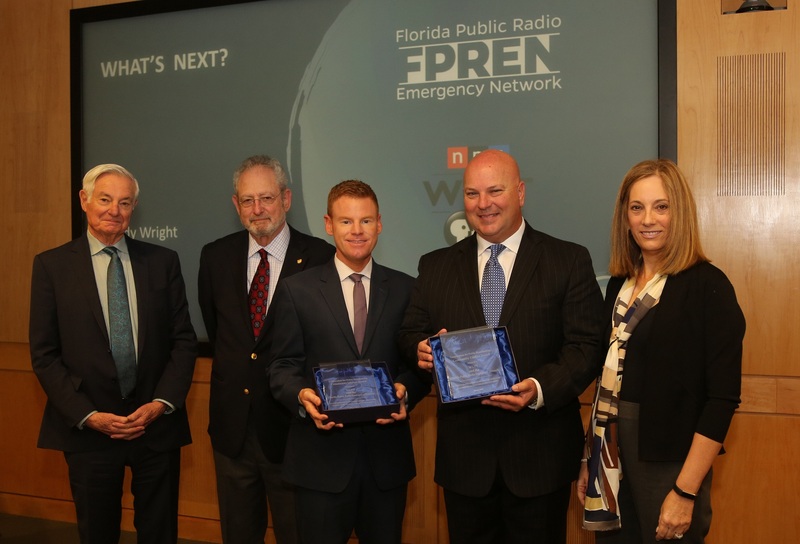 WUFT and the Florida Public Radio Emergency Network received the Community Lifeline Award from the Corporation for Public Broadcasting on March 19, 2019. From left, CPB Board Chair Bruce Ramer, CPB Board member Robert Mandell, FPREN Chief Meteorologist Jeff Huffman, WUFT and FPREN Executive Director Randy Wright and CPB Board member Elizabeth Sembler. FPREN is a collaboration of 13 public radio stations based at WUFT in Gainesville-Ocala, Florida, and delivers emergency broadcast and social media content across the state. Their free app, Florida Storms, provides geotargeted live forecasts, information about evacuation routes and shelters, and live streams local public radio broadcasts. FPREN served millions of people through multiple emergencies including Hurricanes Michael, Irma and Matthew.